Road crews in Alaska have totally repaired a road that was severely damaged by last week’s 7.0 magnitude earthquake near Anchorage. 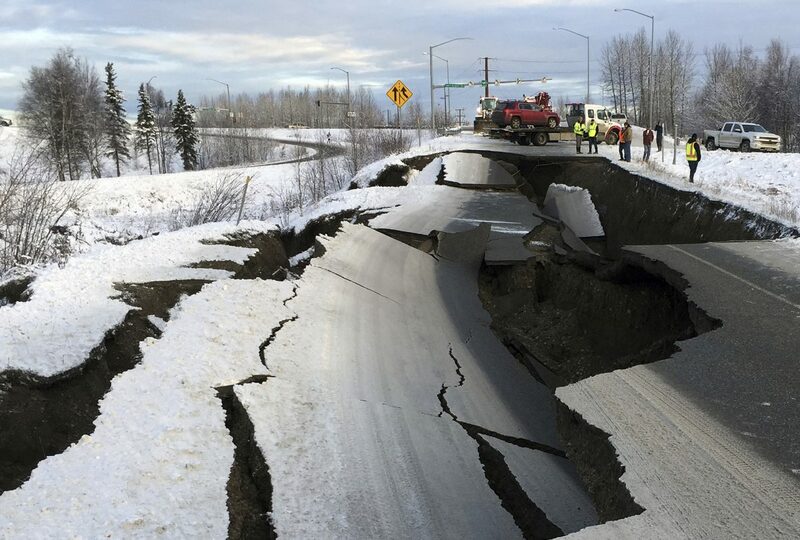 An off-ramp that connects International Airport Road and Minnesota Drive in Anchorage was torn apart in the quake, creating a large hole. Photos shared on Facebook on Dec. 4 showed the speed at which the road was repaired. The hole is gone, the road is paved, and lines have been painted on. It took less than four days, CNN reported. “Here is just another great example how Alaskans are responding after last Friday’s earthquake! The off-ramp at International Airport Road and Minnesota Boulevard in Anchorage was reopened early this morning, complete with new asphalt,” wrote Alaska Tour and Travel. The post went viral around the United States, and many people marveled at the Alaskan road crews and lamented local road crews taking weeks—or sometimes months or even years—to fill potholes in their area. “It would take California years to get this done,” wrote one person, which drew many “like” and “love” reactions on Facebook. “Wow! It takes 6 months to fill a pot hole in TX,” said another. Meanwhile, the Alaska Department of Transportation (DOT) noted that it’s harder to do road work during this time of the year due to the cold temperatures. But they managed to fix the road. “Two main factors affect asphalt compaction: temperature and time. Crews will take extra steps to accommodate for these factors. Alaska’s contractors are experienced and they are dedicated to repairing the asphalt surfaces damaged by the earthquake,” said the DOT on Dec. 3. The Anchorage Daily News reported that residents remained jittery as some 1,800 aftershocks have hit Alaska since Friday’s quake. About 153 measured greater than a 3.0, 18 were greater than 4.0, and five were greater than 5.0 on the Richter scale. “You can expect earthquakes in magnitude 5 or 4 to continue for the next couple of weeks, and as time goes on it tapers off,” Rafael Abreu, a geophysicist with the U.S. Geological Survey Earthquake Science Center, said in the report. Since the quake, people nervous about aftershocks were still grappling with the damage that closed public buildings and schools, clogged roads, and knocked homes off foundations. Some residents went back to work. But state transportation officials again urged people who live north and south of Anchorage to take the day off or work from home to reduce traffic. Rockfalls were still occurring along cliff-lined Seward Highway, while major repairs were underway on hard-hit Glenn Highway, the main road leading north of the city, Department of Transportation spokeswoman Meadow Bailey said, AP reported. “We don’t want the commute to be frustrating because people will experience delays,” she said.